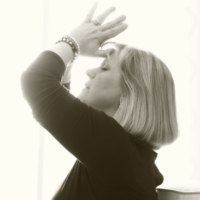 Jody Thomae is an author, worship leader, and teacher of embodied prayer and creative worship. She has been involved in worship arts ministries since 1997 and is the author of “God’s Creative Gift” and the forthcoming book, “The Creator’s Healing Power.” Her passion is for the revelation of God to be made real through the prophetic and creative portrayal of the message of Christ’s unfailing love, in order to help sustain the hearts of the broken and weary. She is particularly interested in how God uses creativity and embodied movement (including yoga) in the formative and healing process. She is a graduate of Ashland Theological Seminary. She has taught yoga for over 15 years and leads a gently challenging Vinyasa flow (or slow, energizing flow) yoga class that is ROOTED (grounded in form, alignment, intention) and REACHING (stretching towards personal goals, dreams, destiny). Classes are in Ashland, Ohio. She is a Registered YogaFaith Trainer (R-YFT), a 200-RYT with Yoga Alliance, and a certified Silver Sneakers Yoga Instructor. YogaFaith is truly honored to have Jody as an Ambassador of Christ! We can’t wait for you to meet her!